Extend and fully power cameras up to 2 kmaway using an open standard SMPTE fiber cable! Blackmagic fiber converters work with standard SMPTE 311M hybrid electrical and fiber optic cables with standard SMPTE 304 connectors on each end. These cables feature a 2 way fiber pair, data pair and power pair, along with a central strength member that gives it the needed durability for continuous use. 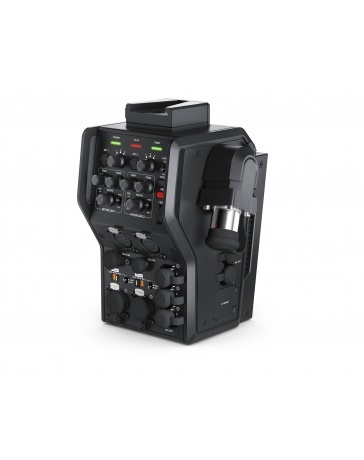 Once plugged in, the Blackmagic Studio Fiber Converter automatically performs safety checks and then powers up, sending an industry standard 200 volts of power over the SMPTE cable for the camera and accessories. This means you can install cameras in remote locations without having to worry about power drops over long distances. Both the studio and camera converters at each end have dedicated micro controllers that continuously monitor power status. The converters communicate with each other to ensure that both a stable optical signal is present and that the power supply is operating within safe parameters. If a damaged cable or a earth leak is detected, the power is instantly shut down to eliminate any danger to personnel. Transform broadcast camerasinto dedicated studio cameras! Super fast, low latency ethernetlink for video, audio and control! Two dual channel talkbackintercoms with backup! Power ConnectorConnect an IEC power cable to the powerinput on the rear panel to provide power. Intercom / TallyThe 25 pin intercom and tally connectionallows you to connect to third party intercom and tally systems or extend your existingATEM converters to other analog devices. 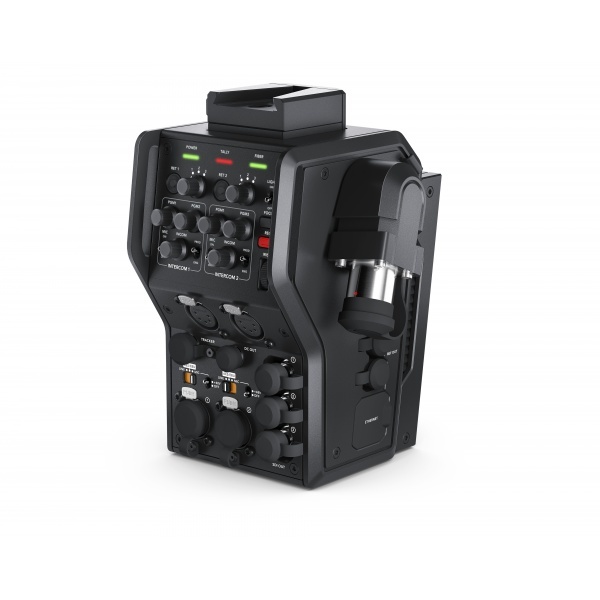 Analog Audio OutFour XLR audio outputs allows you to output the audio plugged into inputs 1 and 2 from your camera, and the two XLR audio inputs on the URSA Camera Fiber Converter. Ref In/OutThe Ref In connection sends traditional reference timing from other broadcastdevices to your camera, and Ref Outacts as a loop output. SMPTE Hybrid Fiber Optic ConnectorUse the URSA Studio Fiber Converter’s female connector to plug in the male end of a SMPTE Fiber cable. Tracker10 pin hirose connector, which sendsout an additional intercom output and red and green tally output. SDI OutThree SDI outputs allow you to output thethree return feeds coming from the switcherto other equipment via 3G SDI. SMPTE Hybrid Fiber Optic ConnectorUse the URSA Camera Fiber Converter’s male connector to plug in the female end of a SMPTE Fiber cable.